Plenty of casual race fans and bloodstock professionals alike have expressed concern about the rule of the stopwatch at 2-year-old sales. In a feature by the Thoroughbred Daily News earlier this month, veteran consignor Niall Brennan said he’s seen a change in breeze-up sales over the past few years. Speed has always been important, but the market has become obsessed with the bullet and employed “Quarter Horse training methods” in which horses have to go flat-out to meet expectations that have little to do with the racetrack. One unnamed investor is hoping to push back against the tidal wave of speed obsession. Last year, Kirkwood Stables’ Kip Elser was approached by a longtime friend and former client at Saratoga who was frustrated by the problem of intense speed at juvenile sales. The result is a five-horse consignment offered by Kirkwood that will be shown to clients at a gallop, not breezing at the upcoming Fasig-Tipton Gulfstream sale. 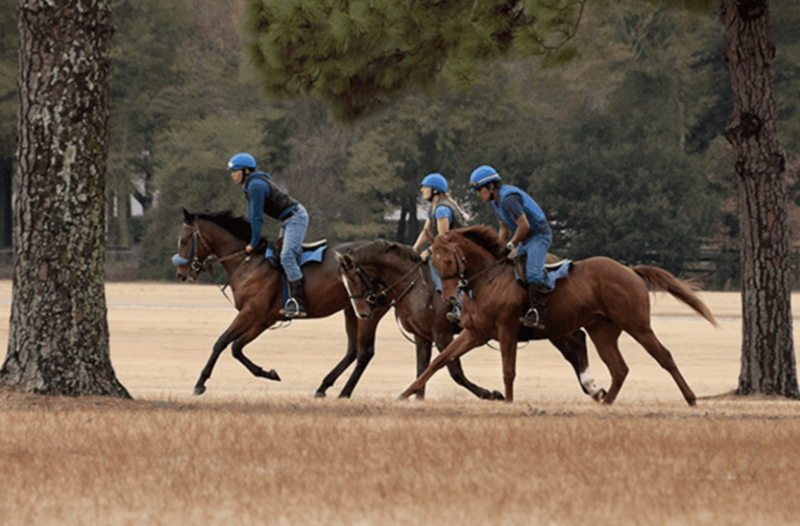 Elser emphasizes the horses have not been breezed at any point in their sale preparation, and the choice to show them at a gallop is not based on the horses’ abilities, but on a plan. “They were bought in the name of Gulfstream Gallop specifically for this project,” he said. “I bought the same horses I would have bought any other year, whether they were going to the 2-year-old sales or the races, and I bought horses I like. Elser says the group is coming along on equal footing, but if he had to pick favorites, he’d highlight Hip 137, a Blame filly from the family of multiple French group stakes winner Colour Chart and Hip 2, a Noble Mission (GB) colt whose half-brother Yulong Warrior won the Al Bastakiya Stakes at Meydan recently.Elser is not the first to try galloping horses at the Fasig-Tipton Gulfstream sale; Adena Springs did the same in 2015 and 2016 with mixed results under the hammer. But Elser said based on racetrack results, those groups of juveniles have done quite well – multiple graded winner Shakhimat and multiple stakes winner Winter came from those consignments, as did graded stakes-placed Scholar Athlete, Jamyson ‘n Ginger and Born To Be a Winner. Some of those horses are still running. Elser agrees with his client that the 2-year-old auction system has created a bit of a monster – but it’s not easy to change market currents single-handedly. He also says that to really make a difference, he may have to try this approach for several years. As long as his client is on board, Elser is fine with that.